Owl & Bird of Prey Sanctuary, Preston Lancashire. Turbary Woods offer a unique collection of over 90 birds of prey including eagles, hawks, falcons, owls, Vultures and more unusual species. Rescue and rehabilitation. One of our main fund raising activities is the Educational talks we provide to schools, Clubs, Scout & Brownie Groups etc. Make A Donation: You can contribute to the running of Turbary Woods Owl and Bird of Prey Sanctuary, Lancashire, by making a donation. Welcome to Turbary Woods Owl and Bird of Prey Sanctuary.You can contribute to the running of Turbary Woods Owl and Bird of Prey Sanctuary, Lancashire, by sponsoring one of our birds. Turbary Woods is Sponsored by Marshall Radio Telemetry, HW Chartered Accountants, Price 4 Print, Big Fluffy Bunnys, West Weald Falconry, Etruk and The Pen Warehouse. Big Fluffy Bunnys Web Design, Hosting, E-Commerce Solutions, Information Driven Websites, Small Business Websites, Website Upgrades and Repairs. Based in Preston Lancashire have a bespoke tailor made site for you and your business. Fast, Friendly with 15 years experince. Help and Information: Tawny Owls - What you can do if you find an injured Bird of Prey. Help and Information: Rehabilitation of Birds of Prey. Fun stuff to do, owl colouring competition, downloads, games, quizzess etc, Red Cliffs Reserve Barn Owl by Rick Wheeler. Fun stuff to do, owl colouring competition, downloads, games, quizzess etc, Red Cliffs Reserve Kestrel by Rick Wheeler. The Artists for Conservation Foundation is a non-profit, international organization dedicated to the celebration and preservation of the natural world. Steven Lingham - Yorkshire Wildlife Artist: Steven is a signature member of The Worldwide Nature Artists Group, The RSPB, The Wildlife Art Society International, and the Marwell International Wildlife Art Society. Toni Watts - Wildlife Artist: I have no formal art training; however, my work has won numerous awards including the Christopher Parsons award for Artistic Excellence. Karen Phillips: Self taught, her only formal art training was to GCSE level art where she experimented with a variety of different media, before finding her real passion for graphite pencil wildlife art. Michael Demain: It was in these early years that he developed a love for wildlife and over the years this love has never waned. Pollyanna is acclaimed as one of Europe&#39;s foremost wildlife artists. The most published artist in the UK, her work sells in over eighty countries world-wide. Julia Hargreaves - Canadian Wildlife Artist. Two times Canadian Ducks Unlimited National Art Portfolio winner, Juliia trained in England at Manchester Metropolitan University. Pablo Dominguez - Artist: Pablos art education includes study with wildlife painter Terry Isaac and plein air painter Paco Young in Montana. This is Albert the Steppe Eagle, Albert is 5 years old and has been in an aviary with another steppe eagle for the last 3 years. This is Knowley, a Tawny Owl, she was rescued on the 4th May 2007, she had fallen from the nest. She had to be hand fed and as such became imprinted, she is now used on our flying display and educational talks. This is Vic, the Tawny Owl, the day he first arrived at the sanctuary. This is Vic, the Tawny Owl at 2 Months. Vic, the Tawny Owl almost fully fledged. Lilo in Flight: How beautiful does he look in a graceful swoop, I wouldn&#39;t like to be a mouse on the ground! Lilo, the Barn Owl with his dinner. Andy and Lilo The Barn Owl. Baby Barn Owl: This young barn owl had left its nest early as the weather had been terrible for 3 weeks and its parents hadnt been able to feed their young ones. 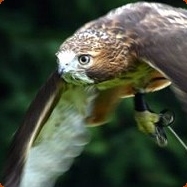 Fru-Tail: This is our fru-tail hawk, on its creance, which we use when training birds of prey. Andy with Shaggy: The Great Gray Owl. White Faced Pixie: White Faced Scoops Owl. Young Kestrel: This little chap was found wandering around a building site, covered in mud and as such was unable to fly. Diamond: One of our male Black Kites soaring above the flying arena. Diamond approaching with stealth, one of our male Black Kites. Diamond, one of our male Black Kites, coming in to land. Andy With his European Eagle Owl Checkers By John McGibbon. A Young Knowley: she was rescued on the 4th May 2007, she is now used on our flying dispaly and educational talks. Knowley In Flight: Rescued Tawny Owl in full flight during a sunny winter day. Knowley Coming To Land: Rescued Tawny Owl in full flight during a sunny winter day. Tawny Owl - Knowley, A rescued Tawny Owl. Our Turkey Vulture, Bernie, in flight. Albert the Steppe Eagle during a winter flying display at Turbaywoods. Albert the Steppe Eagle during a winter flying display. This is Wally a senior and long serving volunteer flying Charlie our very old Red Tail Hawk. This is Checkers, the juvenile Eurasian Eagle Owl, on his first outside display. First Flying Display: Checkers the juvenile Eurasian Eagle Owl, on his first outside display. This is &quot;Dora&quot; The rescued Peregrine Falcon. She fell from her nest as she was almost fully fledged, the bird is now a star attraction in the flying demonstration. Harris Hawk - Skye by John Leneham. Courtesy of Tawny Owl &quot;Knowley&quot; John Lenehan. Black Kite Diamond by John Leneham. White Faced Scops Owl - Gizmo by John Leneham. Barn Owl in Flight by John Lenehan at Turbary Woods Owl and Bird of Prey Sanctuary. Eagle On Hand by John Lenehan at Turbary Woods Owl and Bird of Prey Sanctuary. Hawk Flying by John Lenehan at Turbary Woods Owl and Bird of Prey Sanctuary. Kestrel and Ian by John Lenehan at Turbary Woods Owl and Bird of Prey Sanctuary. The Beginning: Here are some of the volunteers in the team from the early days. New Life: This pic is the sanctuary before we started 3 months of solid hard work, clearing, painting and rebuilding the aviaries. Overgrown: We had to clear several tonnes of leaves and debris, we filled over 5 skips with waste. More of the team: Here are some of the volunteers in the team from the early days. Owls Well: The owlet back safe and sound once more, camouflaged by the ivy. Little Sister: This little lady knows best, Perched at the highest and safest branch. Rescue Owls: Another wise youngster sat close by. This is one of the cleverer siblings that was still high up in the oak tree, Safe away from the cats. Baby Owl Examination: Andy examines the owlet for any broken bones or wind damage. Owl Examination: Andy examining an injured owl. Rescued Duck: Andy and a volunteer helping to free a duck caught in fishing line. Olly was found as a young owlet, barely covered in down,that had fallen from her nest alongside her dead sibling. Vic the adult Tawny Owl, now Fully grown. Vic the Tawny Owlet: This is our first ever rescue, a 3 week old Tawny Owl. Baby Barn owl rescue: These two baby barn owls had jumped from their box in an old barn. Nipper the Bengal Eagle Owl who is the latest rescue addition to Turbary Woods Owl And Bird Sanctuary. Personal Journal of Todd Tokalu - Our Rescue Fox: The sanctuary received a call that a little red fox cub had seemingly been abandoned by its mother. This is his story. As Turbary Woods Owl & Bird of Prey manager, Andy Bilsborough was opening up the Sanctuary with young volunteer Rory, a concerend couple arrived having sighted an escaped bird of Prey near their home. David releases another bird. This tawny owl had been hit by a car and suffered internal injuries. This is Ian, about to release a barn owl that had been hit by a car. The bird made a very quick recovery and we managed to release it after 3 days. This is a young male Harris Hawk that Andy was called out to recapture on saturday afternoon. The picture was taken in the garden it was first spotted in Colne. Rescuers freed a stranded hawk which had spent the day tangled up in a TV aerial in Blackburn. Andy and Michael were called out by the I.B.R. one Saturday morning to rescue this Gyr Saker Falcon from Blackpool. This is Tiley a Common Buzzard, we did train her to fly, but now she is now in an aviary with a male for company. This is Buster a male Ferruginous Hawk taken by Michael Heald. Andy and his best friend, Knowley A rescued Tawny Owl. Harry - The spectacled Owl, That needs Glasses. We have tried to train him to fly, But he keeps missing the glove and Perches. Checkers - Eurasian Eagle Owl. Checker&#39;s Our male Eurasian Eagle Owl. Checker&#39;s Our male Eurasian Eagle Ow and Micheal, During his Flying Training. Shaggy - Our Great Gray Owl in full flight. Checker&#39;s Our male Eurasian Eagle Owl. Charlie The Red Tailed Hawk, photographed by Michael Heald. Kissy the Kestrel, during her training, photograph by Michael Heald. Diamond the Black Kite, photographed by Michael Heald. Sky, the Harris Hawk, takes a bath, photographed by Michael Heald. Great Grey Owl Shaggy, photographed by Michael Heald. Lilo The Barn Owl taken by Michael Heald. Andy with Checkers taken by Michael Heald. Eagle Owl: Turbary Woods offer a unique collection of over 90 birds of prey including eagles, hawks, falcons, owls and more unusual species. Turbary Woods, Owl & Bird of Prey Sanctuary is based in Preston, Lancashire. Eagle Owl Face: Turbary Woods offer a unique collection of over 90 birds of prey including eagles, hawks, falcons, owls and more unusual species. Turbary Woods, Owl & Bird of Prey Sanctuary is based in Preston, Lancashire. Shaggy the Great Grey Owl. Turbary Woods, Owl & Bird of Prey Sanctuary is based in Preston, Lancashire. Skye The Harris Hawk: Turbary Woods, Owl & Bird of Prey Sanctuary is based in Preston, Lancashire. Knowley The Tawny Owl: Turbary Woods, Owl & Bird of Prey Sanctuary is based in Preston, Lancashire. Snowy Owl: Turbary Woods, Owl & Bird of Prey Sanctuary is based in Preston, Lancashire. Charlie the Red Tail Hawk: Turbary Woods, Owl & Bird of Prey Sanctuary is based in Preston, Lancashire. Dora the Peregrine Falcon: Turbary Woods, Owl & Bird of Prey Sanctuary is based in Preston, Lancashire. Bernie Turkey Vulture: Turbary Woods, Owl & Bird of Prey Sanctuary is based in Preston, Lancashire. Bo Female Barn Owl: This is Bo A female barn owl that was born at the sanctuary and is now flown every day by his proud keeper and senior Volunteer Roy. Bo Female Barn Owl: This is Bo A female barn owl taking a Bath. Bo was born at the sanctuary and is now flown every day. Checkers Eurasian Eagle Owl close up taken by Michael Heald. Shaggy - Great Grey Owl close up taken by Michael Heald. Barney - The Rescue Barn Owl Close Up taken by Michael Heald. Albert - Steppe Eagle Close Up taken by Michael Heald. Nanuk - Harris Hawk close up taken by Michael Heald. Dora - Peregrine Falcon close up taken by Michael Heald. Steppe Eagle - Albert close up taken by Michael Heald. Skye - Female Harris Hawk - Close Up taken by Michael Heald. The Tawny Owl (Strix aluco) is a medium-sized owl, 3743 cm in length with an 8196 cm wingspan, which is common in woodlands across much of Eurasia. The Harris&#39;s Hawk or Harris Hawk (Parabuteo unicinctus), is a medium-large bird of prey which breeds from the southwestern United States south to Chile and central Argentina. Owl pellets provide important information to ornithologists about the feeding habits of owls, providing information about the approximate numbers of prey animalsin the owl&#39;s feeding area. Checkers The Eagle Owl from Turbary Woods Owl and Bird Of Prey Sanctuary taken by Danny Weiss. Shaggy Great Grey Owl having lunch after his bath, taken by Danny Weiss at Turbary Woods Owl and Bird of Prey Sanctuary. Shaggy the Great Grey Owl, taken by Danny Weiss at Turbary Woods Owl and Bird of Prey Sanctuary. Shaggy the Great Grey Owl after his bath, taken by Danny Weiss at Turbary Woods Owl and Bird of Prey Sanctuary. Owl from Turbary Woods Owl and Bird Of Prey Sanctuary taken by Danny Weiss. Close up of Owl from Turbary Woods Owl and Bird Of Prey Sanctuary taken by Danny Weiss. Andy with Owl from Turbary Woods Owl and Bird Of Prey Sanctuary taken by Danny Weiss. Owl flying from Turbary Woods Owl and Bird Of Prey Sanctuary taken by Danny Weiss. Owl on perch from Turbary Woods Owl and Bird Of Prey Sanctuary taken by Danny Weiss. Owl in flight from Turbary Woods Owl and Bird Of Prey Sanctuary taken by Danny Weiss. Owl with wings outspread from Turbary Woods Owl and Bird Of Prey Sanctuary taken by Danny Weiss. Flying Owl from Turbary Woods Owl and Bird Of Prey Sanctuary taken by Danny Weiss. Extreme close up of Owl from Turbary Woods Owl and Bird Of Prey Sanctuary taken by Danny Weiss. Barn Owl from Turbary Woods Owl and Bird Of Prey Sanctuary taken by Danny Weiss. Face shot of Owl from Turbary Woods Owl and Bird Of Prey Sanctuary taken by Danny Weiss. Baby Owls from Turbary Woods Owl and Bird Of Prey Sanctuary taken by Danny Weiss. Swan at Turbary Woods Owl and Bird Of Prey Sanctuary taken by Danny Weiss. Andy and Owl from Turbary Woods Owl and Bird Of Prey Sanctuary taken by Danny Weiss. Uclan Photo Shoot: UCLAN Fashion student with Stella the Steppe Eagle from Turbary Woods. UCLAN Gallery 2: UCLAN Fashion student with Stella the Steppe Eagle from Turbary Woods. UCLAN Gallery 3: UCLAN Fashion student with Stella the Steppe Eagle from Turbary Woods. UCLAN Gallery 4: UCLAN Fashion student with Stella the Steppe Eagle from Turbary Woods. UCLAN Gallery 5: UCLAN Fashion student with Stella the Steppe Eagle from Turbary Woods. UCLAN Gallery 6: UCLAN Fashion student with Stella the Steppe Eagle from Turbary Woods. Baby Owls by John McGibbon taken at Turbary Woods Owl and Bird of Prey Sanctuary Preston. Barn Owl In Tree by John McGibbon taken at Turbary Woods Owl and Bird of Prey Sanctuary Preston. Owl On Perch by John McGibbon taken at Turbary Woods Owl and Bird of Prey Sanctuary Preston. Owl Closeup by John McGibbon taken at Turbary Woods Owl and Bird of Prey Sanctuary Preston. Hawk Closeup by John McGibbon taken at Turbary Woods Owl and Bird of Prey Sanctuary Preston. Kestrel by John McGibbon taken at Turbary Woods Owl and Bird of Prey Sanctuary Preston. Owl Head Closeup by John McGibbon taken at Turbary Woods Owl and Bird of Prey Sanctuary Preston. Owls In Flight by John McGibbon taken at Turbary Woods Owl and Bird of Prey Sanctuary Preston. Owls Flying by John McGibbon taken at Turbary Woods Owl and Bird of Prey Sanctuary Preston. Owl Eating by John McGibbon taken at Turbary Woods Owl and Bird of Prey Sanctuary Preston. Barn Owls Flying by John McGibbon taken at Turbary Woods Owl and Bird of Prey Sanctuary Preston. Barn Owl by John McGibbon taken at Turbary Woods Owl and Bird of Prey Sanctuary Preston. Hawks Flying by John McGibbon taken at Turbary Woods Owl and Bird of Prey Sanctuary Preston. Grey Owl by John McGibbon taken at Turbary Woods Owl and Bird of Prey Sanctuary Preston. Owl On Statue by John McGibbon taken at Turbary Woods Owl and Bird of Prey Sanctuary Preston. Barn Owl from Turbary Woods Owl and Bird Of Prey Sanctuary taken by David Toase. Owl from Turbary Woods Owl and Bird Of Prey Sanctuary taken by David Toase. Great Grey Owl from Turbary Woods Owl and Bird Of Prey Sanctuary taken by David Toase. Eagle Owl from Turbary Woods Owl and Bird Of Prey Sanctuary taken by David Toase. Kestrel from Turbary Woods Owl and Bird Of Prey Sanctuary taken by David Toase. Hawks and Falcons from Turbary Woods Owl and Bird Of Prey Sanctuary taken by David Toase. Steppe Eagle from Turbary Woods Owl and Bird Of Prey Sanctuary taken by David Toase. Eurasian Eagle Owl taken by Ryewolf at Turbary Woods Owl and Bird of Prey Sanctuary. Flying Display taken by Ryewolf at Turbary Woods Owl and Bird of Prey Sanctuary. Steppe Eagle taken by Ryewolf at Turbary Woods Owl and Bird of Prey Sanctuary. Tawny Owl taken by Ryewolf at Turbary Woods Owl and Bird of Prey Sanctuary. Coco - The Boobook Owl by Ryewolf at Turbary Woods Owl and Bird of Prey Sanctuary.